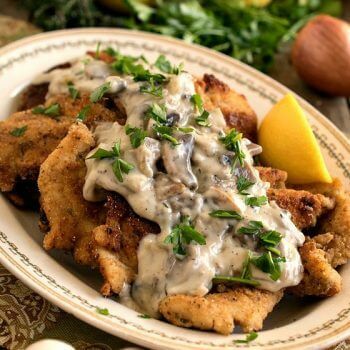 Escalope – as you’ll see in today’s recipe for Chicken Escalope with Mushroom Sauce – is a French term that refers to any type of boneless meat that has been pounded and thinned out using a mallet. 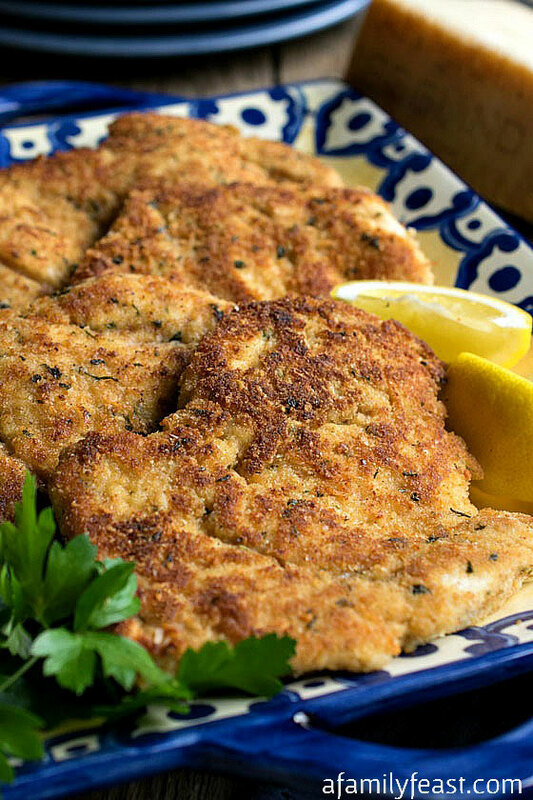 Thinning out the meat before cooking allows the chicken (or other meats that you prepare in a similar way) to cook quickly and evenly – and this technique is used in many kinds of dishes including our earlier Parmesan Chicken Cutlets recipe, a classic Italian-inspired Chicken or Veal Parmesan, or Schnitzel. 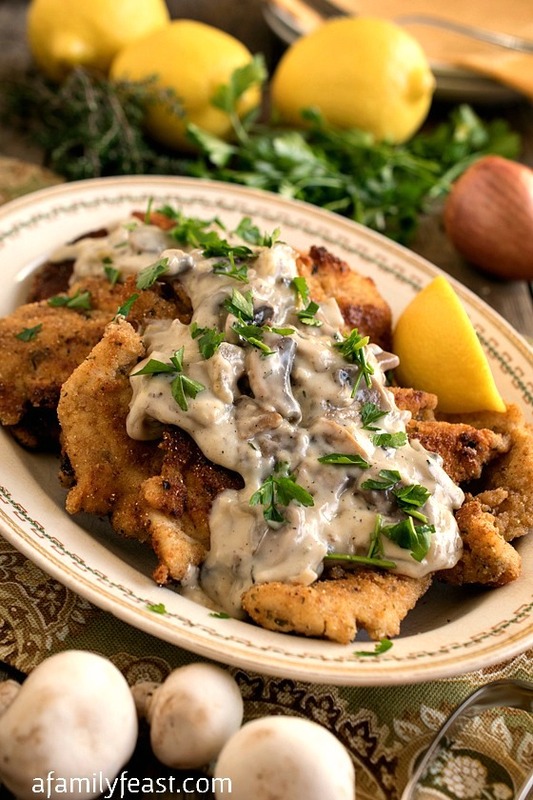 In today’s recipe – we breaded and fried the chicken breasts, then smothered them in a flavorful mushroom sauce made with button mushrooms, shallots, chicken stock, milk and thyme. 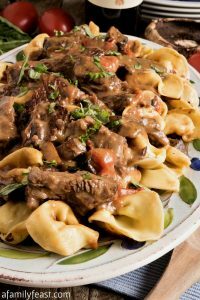 We finished the dish off with a squeeze of lemon juice which adds a wonderful fresh taste to the creamy mushroom sauce and a sprinkle of fresh, chopped parsley. 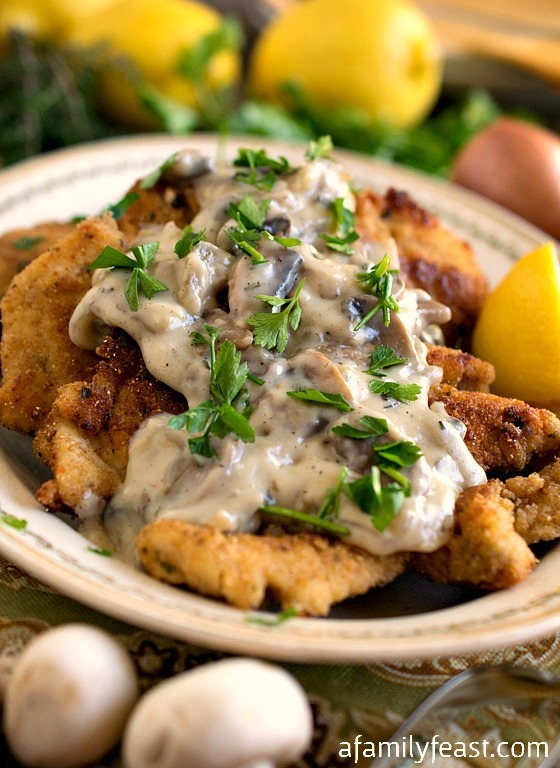 This Chicken Escalope with Mushroom Sauce is simple and quick enough for a weeknight dinner, but it’s also elegant enough for a special dinner party. Enjoy! Butterfly the chicken breasts to get them uniform in size before pounding. To do this, run a sharp knife under the tenderloin side from the inside center, through the thick tenderloin, almost to the edge and then fold it open. Then turn the breast around and do the same by running the knife from the center through the thickest part out almost to the edge and fold that open (picture the wings of a butterfly). Cover with plastic wrap and pound to about ¼ inch thick. Repeat for other breast then cut both breasts in half to yield four pieces. (Any shape is fine). Dredge each piece in the flour, shake off excess and then coat with egg wash. Finally coat with the breadcrumbs and lay out on a plate. Place the plate in the refrigerator while making the sauce. 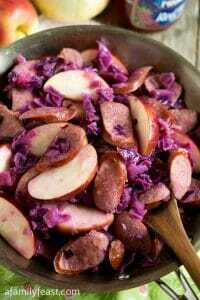 In a small pan, cook stock and reduce to one cup. Add milk, heat and hold on low. 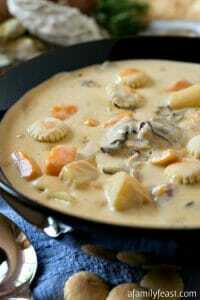 In a medium skillet over medium heat, melt the 4 tablespoons of butter and add shallots. Cook for two minutes and add mushrooms and thyme. Continue to cook. The mushrooms will give up some liquid then the liquid will evaporate, about five minutes. Add flour and stir and cook for three more minutes. Add milk and stock mixture to mushroom mixture one third at a time, stirring as you go. Season with salt, pepper and lemon zest. Reduce flame to low and hold while you cook chicken. In a large sauté pan over medium to medium high heat, melt 2 tablespoons of butter with the two tablespoons of oil until hot. Remove chicken from refrigeration and fry pieces in hot fat until browned on both sides. Because they are pounded thin, they will only take but a few minutes on each side. Remove to paper towels then place on a serving platter and drizzle lemon juice over each piece. Pour sauce over the cutlets or serve sauce on the side and finish by sprinkling on chopped parsley. Such a nice way to jazz up chicken. 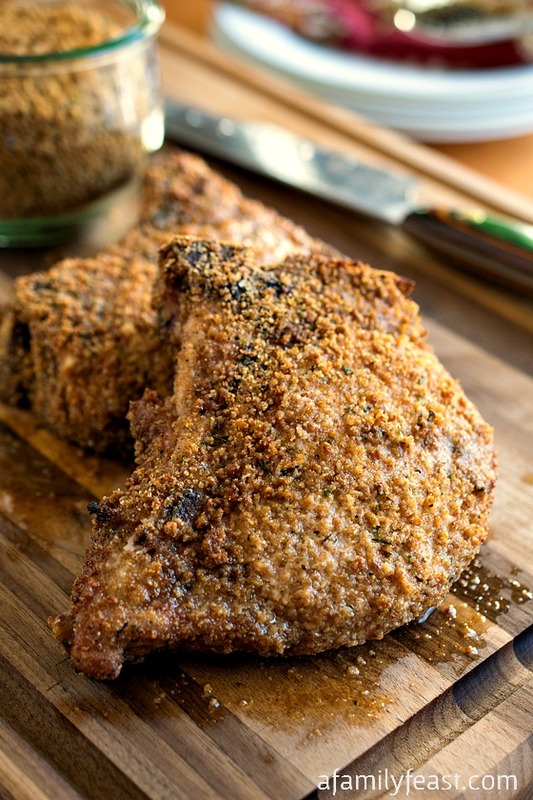 Pounding it thin definitely helps make this a quick weeknight meal. Love homey, comfort foods like this. And chicken-fried anything is a great favorite too. My grandmother used to make dishes like this. Looking forward to revisiting an old favorite. Your version looks so delicious. Martha, I love learning about new ways to prepare foods!!! totally going to try this the next time I make chicken! 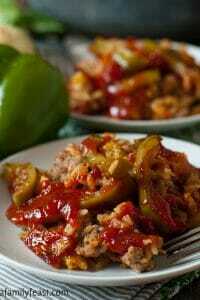 and I love this recipe!! and that mushroom sauce. . oh my gawd!! I think I could eat chicken for dinner every night! There are endless ways to prepare it. This looks so delicious. 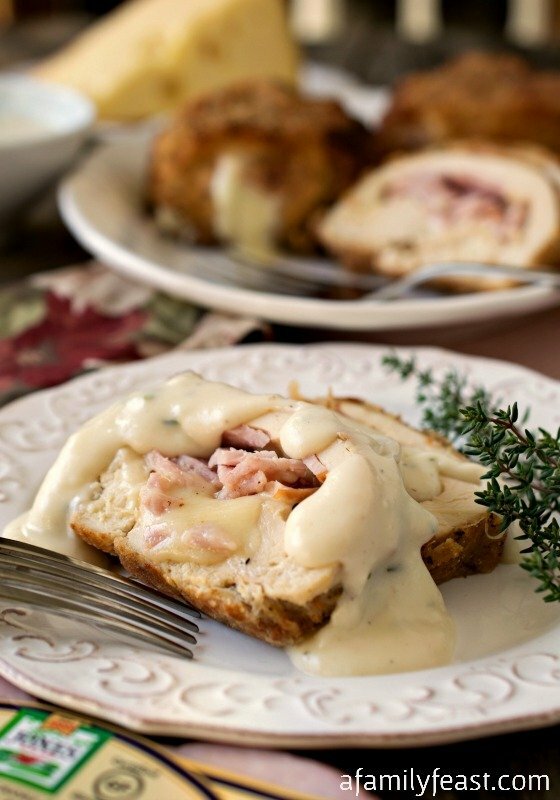 This is one of my favorite ways to do chicken – the mushroom sauce looks so rich and delicious! This chicken dish looks great. I love chicken but run out of ideas on how to prepare it. You just helped up spice up our chicken!